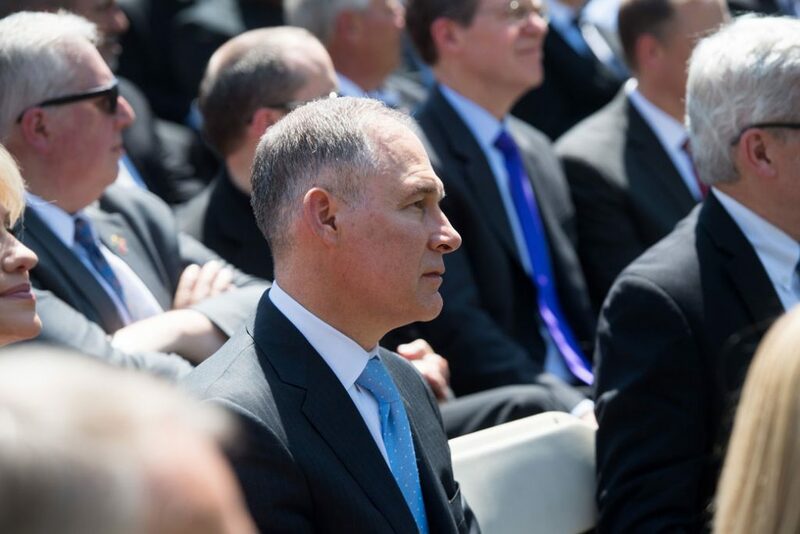 Environmental Protection Agency (EPA) Administrator Scott Pruitt is facing at least 16 federal investigations based on his established pattern of harmful actions against the environment and the manipulation of his position of power for personal gains. Throughout the first year of his appointment as the head of the EPA, Pruitt has continually and wrongfully attempted to legitimize his dangerous ideologies and actions under the guise of religion. He has consistently quoted scripture to justify his attacks on public health that will have lasting consequences for the environment. Reflective of his lifelong commitment to Christianity, Scott Pruitt regularly references scripture, often to support his policy decisions about energy and the environment. Pruitt has suggested that the Earth was created for human beings to fully use its resources. Last July, he told Politico, “God has blessed us with natural resources. Let’s use them to feed the world. Let’s use them to power the world. Let’s use them to protect the world.” What’s more, in a recent interview with the Christian Broadcasting Network, Pruitt stated that “we have a responsibility to manage and cultivate, harvest the natural resources that we’ve been blessed with to truly bless our fellow mankind.” Both instances imply a narrow reading of the book of Genesis, one which is further reflected in Pruitt’s many regulatory rollbacks that will harm the environment. In Genesis 1:28, God instructs Adam and Eve to have “dominion over the fish of the sea, over the fowl of the air, and over every living thing that moveth upon the Earth.” The concept of dominion in the Bible does not connote destruction or the extraction of all resources—both monetary and natural—for the enrichment of oneself. Rather, it implies a responsibility for the care and nurture of one’s environment. Dominion is like a parent who gives charge of their child to a babysitter, and that babysitter is expected to protect the child as a parent would. Without proper contextualization, Pruitt has conveniently used these verses to justify the loosening of regulations at the request of his connections to various industries, including the auto, chemical, and oil and gas industries. Pruitt’s actions as head of the EPA largely have been for personal gain, and his misrepresentation of scripture to serve himself is no different. Pruitt’s selective interpretation of Genesis excludes the concept of stewardship, which suggests that protecting, respecting, and being stewards of all things on Earth is a form of loving God, because the Earth is a product of God’s creation. Proverbs 27:18, which states “the one who guards a fig tree will eat its fruit, and whoever protects their master will be honored” affirms that the use of the Earth’s resources is contingent upon respect and protection of them, which is in contrast to Pruitt’s dangerous policies. Additionally, Leviticus 25:4 outlines how one should treat the land, particularly during “the Sabbath year,” in which the land is to be untouched every seven years: “But in the seventh year the land is to have a year of sabbath rest, a sabbath to the Lord. Do not sow your fields or prune your vineyards.” Leviticus 25:23 reemphasizes that the land does not belong to us; rather, it is an extension of God: “the land is mine and you reside in my land as foreigners and strangers.” A comprehensive interpretation of the Bible suggests that one’s attitude toward the environment is an extension of respect for God. In launching attacks against air, water, and public lands, Pruitt’s actions as EPA administrator have not embodied the intrinsic value of human life in Christianity, despite recent claims that he has acted “with stewardship principles in mind.” For example, he refused to ban chlorpyrifos, a pesticide that causes brain damage in infants and children. Stewardship requires care for the Earth and all things that dwell on it, such as the health of infants and children, and not exploitation and harm. This ban goes against the recommendation of EPA scientists and directly benefits Dow Chemical, a company that has supported the Trump administration with large monetary contributions. These excessive donations contradict with the concept of greed in the Bible, which is stated in Luke 12:15 as something to avoid—“be on your guard against all kinds of greed; life does not consist in an abundance of possessions.” In addition, when God created Adam and Eve, “God created mankind in his own image, in the image of God he created them; male and female he created them,” as Genesis 1:27 states. Because the Bible states that humans were made in God’s image, it is important to value them with respect and dignity. Pruitt’s actions against environmental protection, as well as his dirty dealings, speak louder than his words of Bible verses. Pruitt’s attempts to undermine critical protections for our clean air and water should not be viewed as the result of an inherent conflict between science and religion. Early scientists, including Nicholas Copernicus, Johannes Kepler, and Isaac Newton, viewed their scientific discoveries as extensions of their faith. Similarly, many of today’s faith-based organizations spearhead environmental protection initiatives. In Laudato Si’, Pope Francis’ second papal letter sent to all bishops of the Roman Catholic Church, the pope uplifted the importance of environmental justice and preserving the well-being of all humanity. He writes that the reading of Genesis supporting the exploitation of the Earth’s resources “is not a correct interpretation of the Bible as understood by the Church,” because “the earth was here before us and it has been given to us.” In addition, the Evangelical Climate Initiative, a group of prominent evangelical pastors and professors, released a declaration in 2006 calling for the protection of the environment. Though there has been pushback from within the evangelical community regarding the extent to which humans are responsible for climate change, those evangelical Christians who are opposed to climate justice do not represent all faith-based views on the environment. The complete separation of science and religion is a false binary; not only can they coexist, but also, they often times complement each other. A comprehensive interpretation of religion is essential, because every assertion of scripture does not automatically justify policy. As Pruitt continually cites the Bible to support his harmful decisions and culture of corruption, it is important to remember that a faithful interpretation of scripture requires one to consider context to avoid misrepresentation. Religious values can inform progressive policy in all forms, including environmental protection, and religion should not be misused to justify harmful attacks on the health of all living beings.